Supporters of candidate Abdel-Fatah El-Sissi have already started to celebrate preliminary results which indicate that the former defence minister has trounced his rival Hamdeen Sabahi in a landslide in Egypt’s presidential election. Thousands of Egyptians gathered in public spaces, including the iconic Tahrir Square, as the electoral commission announced that El-Sissi had won 92.2 per cent of the vote to Sabahi’s 3.2 per cent, with over half of the ballots counted. But it was the amount of void ballots – 4.6 per cent of tallied votes – which raised eyebrows among Egypt observers. Local media reported that some voters had written diatribes or jokes instead of marking their choice for president. The first challenge for El-Sissi now is to secure a popular mandate; on Wednesday, the extended day of voting, turnout was light, reports said. 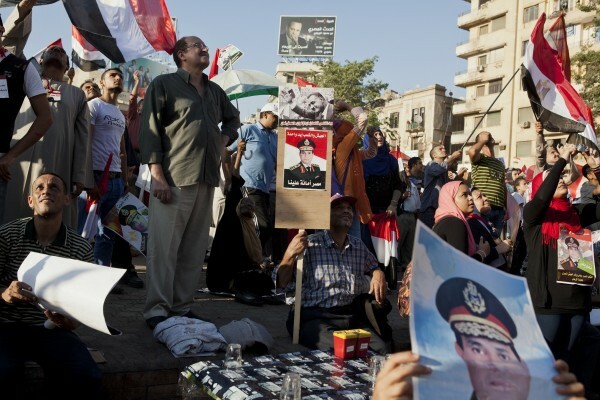 El-Sissi campaigners and supporters had urged women and youth in particular to cast their votes. Voter turnout for the 2014 Constitutional Referendum in January was just above 38 per cent. This was a considerable decrease from the 52 per cent turnout for the runoff presidential election in 2012, which was won by Muslim Brotherhood candidate Mohamed Morsi. El-Sissi ordered Morsi removed from office on July 3, after massive populist demonstrations called for his ouster. Late on Wednesday, judicial observers told Reuters that voter turnout by the third day of voting had reached 44.4 per cent. Some in the government blamed the two-day heat wave which began Monday for the lower-than-expected turnout. Temperatures reached 41 Celsius in Cairo on Tuesday, but fell to 35 on Wednesday.